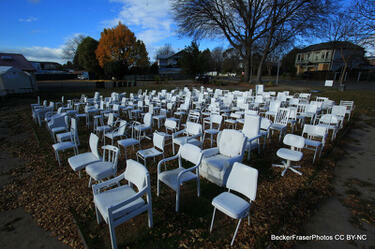 Photograph captioned by BeckerFraserPhotos, "Oxford Terrace Baptist Church". 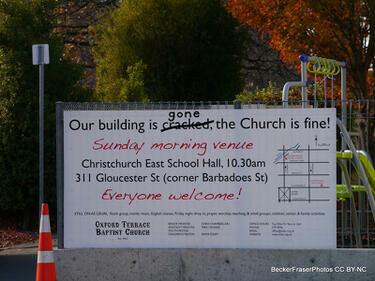 A sign at the demolition site of the Oxford Terrace Baptist Church reading, "Our building is gone, the Church is fine!". 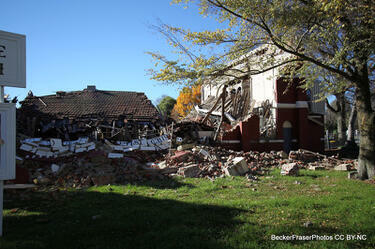 A photograph captioned by BeckerFraserPhotos, "The demolition site of Oxford Terrace Baptist Church". 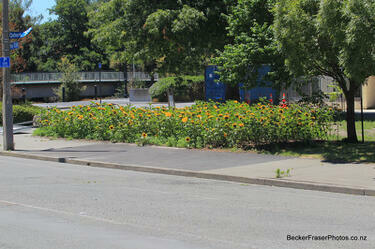 A photograph captioned by BeckerFraserPhotos, "Sunflowers planted on the site of the Oxford Terrace Baptist Church". 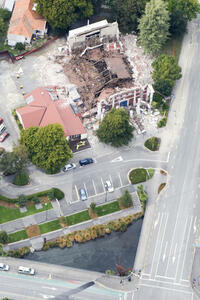 An aerial view of Christchurch a week after the 22 February 2011 earthquake. The Oxford Terrace Baptist Church can be seen. 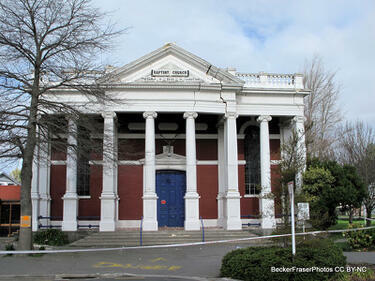 The Oxford Terrace Baptist Church with major cracking to the front facade. Tape has been placed around the building to warn people to stay away. 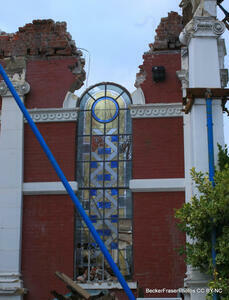 Detail of the cracking in the facade of the Oxford Terrace Baptist Church. 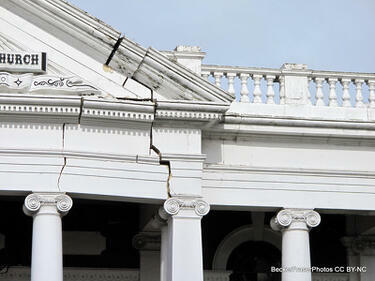 Cracks in the facade of the Oxford Terrace Baptist Church. 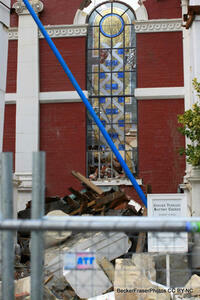 The Oxford Terrace Baptist Church showing severe cracks in its facade. 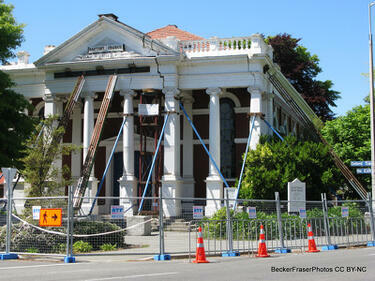 Metal beams have been used to prop up the building and its base is enclosed by a safety fence. 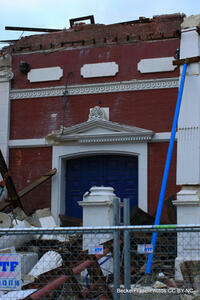 A front entrance of the badly-damaged Oxford Terrace Baptist Church. 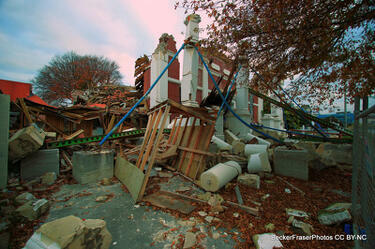 The roof of the building has crumbled onto the footpath below. 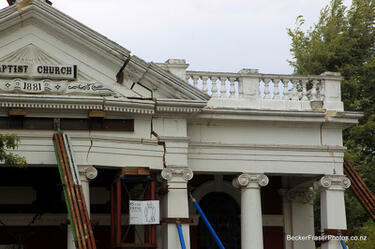 Damaged brickwork is still visible above. Steel bracing has been placed against the wall to keep it upright. 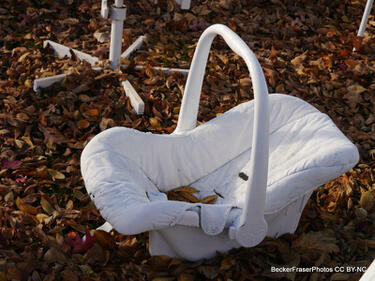 Photograph captioned by BeckerFraserPhotos, "The north side of the Oxford Terrace Baptist Church". 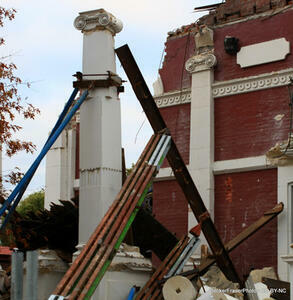 A close-up view of the badly-damaged Oxford Terrace Baptist Church. 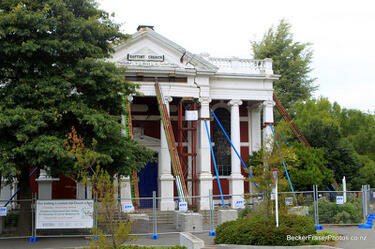 The Oxford Terrace Baptist Church with cracks on the front facade. 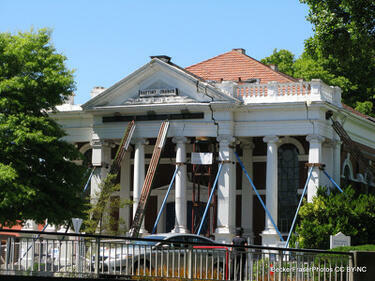 Bracing has been placed under the roof and at the front of the church to support the building and limit further damage from aftershocks. A cordon has been made around the building with fencing and road cones. 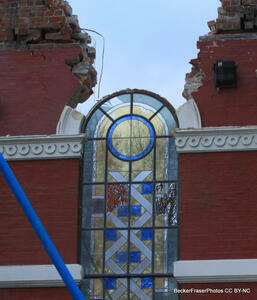 The Oxford Terrace Baptist Church with cracks on the front facade. Bracing has been placed under the roof and at the front of the church to support the building and limit further damage from aftershocks.